I figured I’d drop a note that I updated my Textarea Backup UserJS last month. What follows is the description from ExtendOpera. Retains what you type into textareas and contentEditable elements. This script is only compatible with Opera 10.50 and up. If you need to use it with an older version use Textarea Backup but be advised that it comes with some disadvantages. Can automatically place previously typed text in textareas. 1.21 July 25, 2013. Sorry, I was a bit hasty about that last one. I passed my testcase, but only noticed that many contentEditables work differently in practice on this very site. Fixed a bug that occurred when BODY was contentEditable, as is typical in iframes. Properly compare initial value of contentEditable element to backed up value so you’ll only get prompted to overwrite when relevant. 1.20 July 25, 2013. I wasn’t going to make yet another release in three days, but these new features could be implemented much faster than I initially predicted. Trustworthy old persistent preferences support added. I also uploaded a sample settings file. Fixed the keep_after_submission bug, so setting it to false is safe again. Support contentEditable. This is a pretty big one, seeing how it was the most obvious missing feature. 1.11 July 24, 2013. Added configuration switches for the new feature. 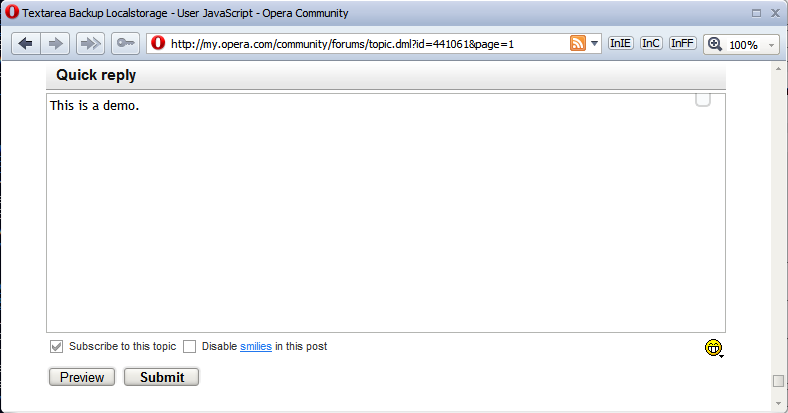 For Opera 11.6x and Opera 12.x it now defaults to off because of potential performance concerns. 1.10 July 23, 2013. Added support for dynamically added textareas. This new feature will only work in Opera 11.6x and up.